As an emergency dentist in Aloha, OR, our team at Slater Family Dental know firsthand that sometimes your oral health requires immediate attention. Many patients visit our Aloha dental office looking for pain relief. While most oral health issues that cause discomfort are easily identifiable, some issues are harder to pinpoint. Facial pain can be the result of joint, muscular or other dental issue, but the pain may also be caused by a psychological or neurological issue. Whatever the cause of your discomfort, you should never ignore any pain oral problem. Pain acts as the body’s alarm system. When it goes off it usually means that something worse will eventually happen if you don’t seek treatment. If you suffer from oral discomfort, our team at Slater Family Dental will be able to recognize and treat neuropathic, muscle, joint, and other conditions that result in oral pain in the face and mouth. While most of the conditions that causes this type of discomfort can be treated at our Aloha dental office, some conditions may require being referred to a specialist. Determining if a joint or muscle is the source of your pain can be difficult, however, if the source of the discomfort seems to radiate from near the jaw joints. Range-of-motion tests can help determine if the joint or muscle is the cause of the problem. If the joint is the issue, you’ll experience a limited amount of jaw movement, while if the pain is the result of a muscle issue, you’ll typically have trouble opening your mouth. Patients who suffer from joint issues will also experience discomfort whenever they move their jaw as well. Referred pain occurs when a muscle hurts and the pain seems to radiate out to other, even remote, areas of the body. Pain is felt when the muscle is touched, but the discomfort can also be felt in your teeth or forehead. Due to the difficult nature of identifying the source of referred pain, most patients will fail to realize the actual source of their discomfort. Patients may complain of headaches not realizing the actual source of the discomfort is, say, their lower jaw muscle. 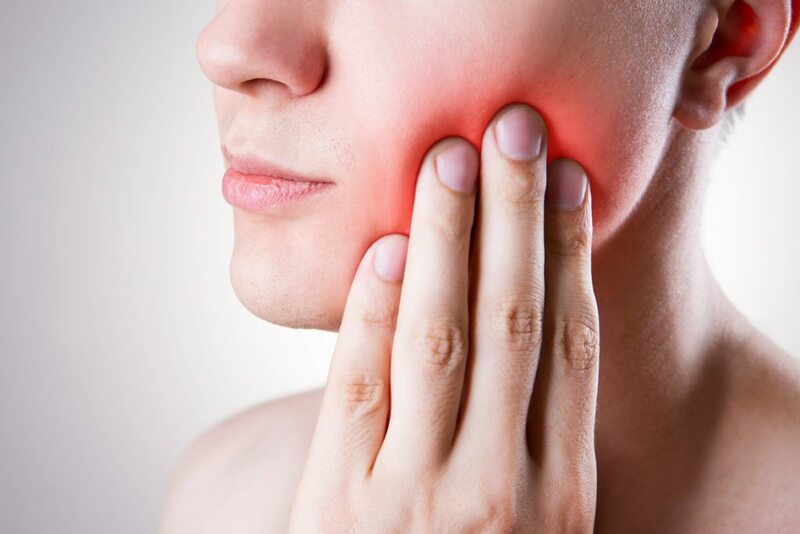 This makes it necessary for our dentists to conduct a thorough examination to determine whether the pain is originating from another area of the body. Once our Aloha dentist accurately determines the true source of your discomfort, a customized treatment plan will determine how best to fix the issue. Neuropathic or nerve pain is very uncommon. However, patients who experience this type of discomfort often believe their problem oral health related as nerve pain often seems to radiate from their teeth and gums. When a patient experiences pain in a tooth, the nerve of a tooth actually runs directly to the brain. When the signal for pain arrives to the brain from the nerve, it tricks the brain into believing the tooth is actually the root cause of the discomfort. If a patient suffers from an abscess, decay or a fracture, the brain believes that pain is coming from a certain tooth. While the brain is often right in these situations, in some rare cases the discomfort may actually be caused by a nerve related issue. As an emergency dentist in Aloha, OR, our team at Slater Family Dental understands how to accurately determine the true source of a patients’ discomfort. If you suffer from unexplained discomfort, you can feel confident knowing that our team will only proceed with a treatment plan once a complete and accurate determination of the source of your pain is discovered.